Beware the raven, for its eyes are not only its own. What it sees, Odin himself may also see! The Raven Flight Ring fits a captive corvus on your finger, making one of Odin's own messenger-birds into an accent for your look. The ring is crafted entirely in quality pewter, with a polished band and a darker-toned raven accent. Caught mid-flight, the bird spreads its wings and opens its beak as if to caw. 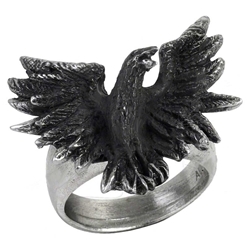 Luckily, this raven is not about to go anywhere, which leaves this Raven Flight Ring as an intriguing way to add something dark and symbolic to your look - whether it is Viking inspired, modern, medieval, or anything in-between!